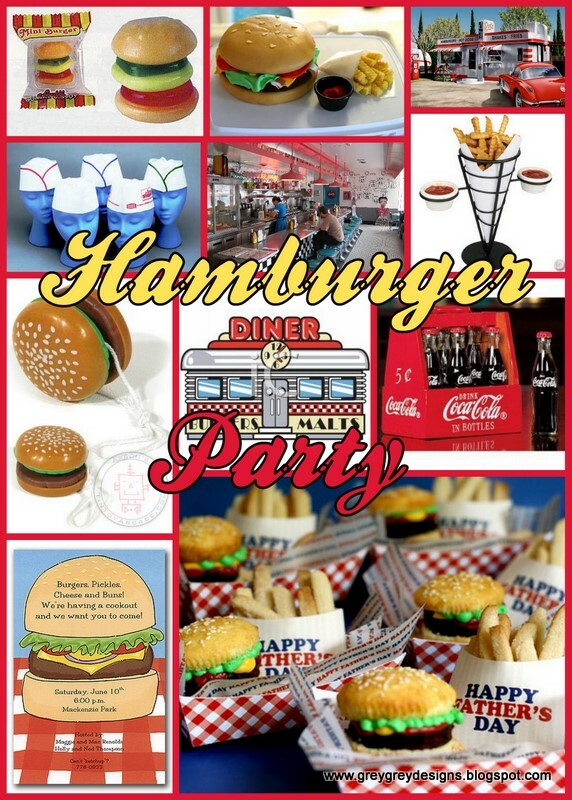 GreyGrey Designs: It's a Hamburger Party! After Christmas, for the past few years, I have been immediately planning Greyson's birthday party. His birthday is in the middle of March. And this year, I wanted a fun, offbeat theme for his 3rd birthday. I was inspired by his ridiculous love of french fries. Really, the child could eat pounds and pounds of them. But, you can't just have a french fry party and NOT have hamburgers, so I decided on a hamburger and french fry theme! I've got some awesome collaborations up my sleeve for this one, and I could not be more excited about it. Can't WAIT to do this one! I love hamburger and french fry stuff too. I have a whole collection of serving pieces, dishes and decor. Can't wait to see what you come up with! Oh WOW! This looks totally fun and definitely unique! Can't wait to see the final outcome. Im loving this.... Hamburgers are my favorite! This sounds too fun and too doggone cute! Precious idea!!! I love it! !